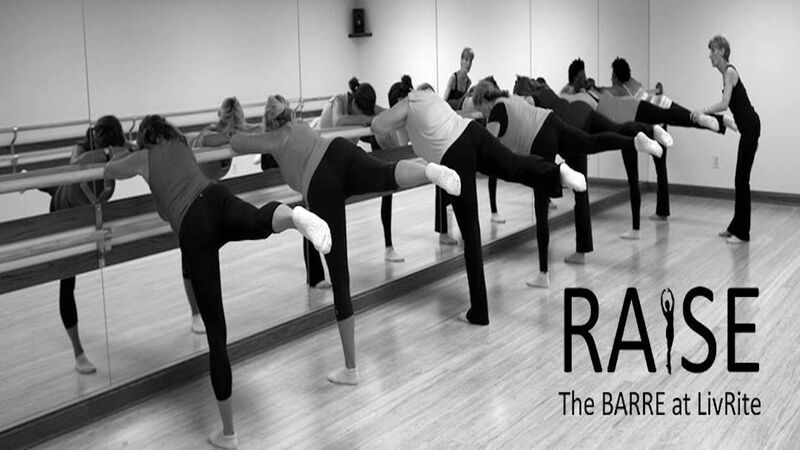 Designed by a former professional ballet dancer, Barre class at RAISE is a total body workout to get you in shape quickly and keep you that way. It is a fun way to accomplish your fitness goals. You will see improved strength, agility, discipline, flexibility, and energy. No prior training is required. The class begins with stretches and warm ups. Those are followed by specific exercise for your entire body. Your problems will fade into the distance as you enjoy this fun, yet thorough workout. It is a good way to start, or end, your day. What shall I wear for a class? Dress comfortably in exercise pants or sweats with a tank or T-shirt. Always wear socks and sticky socks are recommended. We sell them at RAISE for your convenience. I’ve heard it makes you shake. What is this? If your muscles shake, it is a good thing! It means you are working towards fatiguing the muscle that you are working. This is the place where you are getting stronger. Stretching the muscle then helps it develop into a long. lean line. Results should come quickly, but you will have ultimate control over them. You will get the best results if you attend class at least 3 times a week and eat a proper diet. You should still see results attending class once or twice a week. It’s ultimately up to you! Want more info? Like us on Facebook and follow us on Instagram and Pinterest for the latest news and special offers !